We've seen budding stunt drivers and now let's take a look at this real life daredevil, who at 8 is the youngest wing-walker in the world. 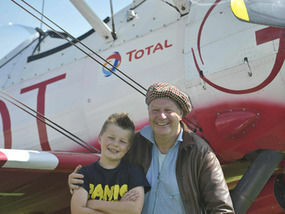 Tiger Brewer, who grew up around a family of wing-walkers, flew at 100mph at 1,000 feet over Rendcomb Airfield in Gloucestershire on the wing of his grandfather Vic Norman's biplane. "On take-off I was scared. From one to 10 it was probably a nine, but when I was in the air it was probably a five. "You don't have a parachute, just a pair of goggles." Beating the previous world record holder Guy Mason, he stood by his mantra - "Go away fear" - to help him get through with the stunt.